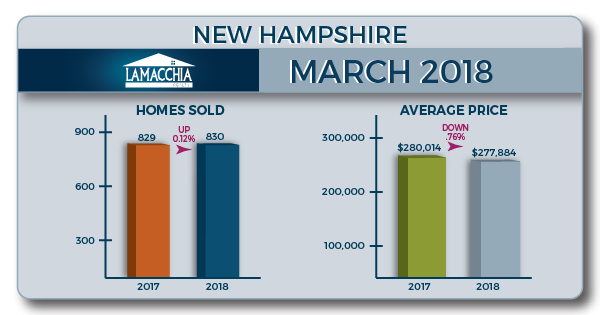 The Lamacchia Housing Report presents overall home sale statistics and highlights the average sale prices for single families, condominiums, and multi-family homes in Massachusetts and Southern New Hampshire for March 2018 compared to March 2017. It also looks at other metrics in Massachusetts like Homes Listed and Pending, as they are often the best indicators for predicting future trends in the market. Massachusetts home sales decreased 5.2%, from 6,401 in March 2017 to 6,068 in March 2018. Single families decreased in sales by 7.89% from the year before. 3,943 were sold in March 2017, compared to 3,632 this year. Condos increased by .11% with 1,853 in March 2017 to 1,855 in 2018. Multi-families decreased by 3.97% from 605 in March 2017 to 581 in 2018. Overall, prices increased by 4% in March 2018, from $401,510 in March 2017 to $417,571 last month. Prices increased in multi-families by 4.14%, from $417,973 to $435,290. Single-family prices increased 2.78%, going from $442,805 to $455,120 and condos saw the greatest increase of 7.12% with prices moving from $326,529 to $349,768. 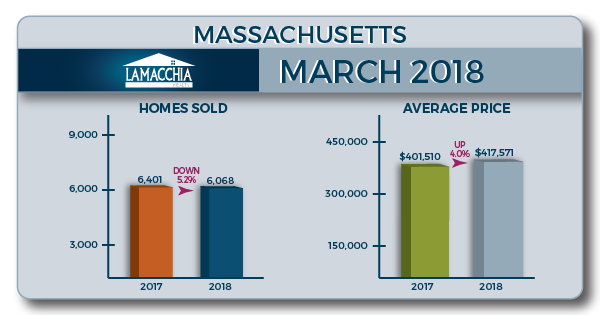 In March 2017, 10,217 homes were listed for sale in Massachusetts compared to 8,673 in 2018, showing 15.11% decrease. This is a strong change from last month’s 11% increase. 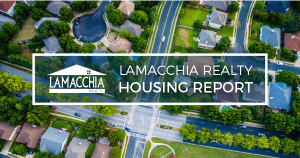 There were 9,074 homes that went pending in March 2017 and 8,574 in March 2018 showing a 5.51% decrease. With both listed and pending numbers showing decreases, we will likely see sales numbers down for April as well. The number of properties sold in Southern New Hampshire increased barely, by .12% from 829 to 830. Multi families saw the largest decrease of 11.63% going from 43 sales in March 2017 to 38 last month. Single family sales decreased 3.78%, now at 560 from 582, and condos saw the only increase- by 13.73% up to 232 from 204 last year. The average price for homes in New Hampshire decreased by just under a percent, at .76%. While single-family prices increased 1.22% (from $296,811 to $300,425), condos decreased in average prices by 2.33% (from $222,831 to $217,640), and multi-family prices also saw a decrease of 4.86% (from $320,065 to $304,522). In February, with sales, prices, and the numbers of listed and pending homes up, it appeared that March would be a strong month for sales but that didn’t happen. With pending numbers being down in March and down April 1st to April 15th it is likely that sales will be down in April as well. The lack of inventory is really causing a lot of frustration for buyers and Realtors alike. It is also causing fear among sellers who are worried about listing their homes because they don’t think they will find the home they need in time. In the last ten days, seller activity and homes being listed seems to have really picked up, so sales will rise again in the months to come but we are not convinced sales will be up for the year. However, it’s very early to tell.